Lamborghini Centenario Roadster supercar is a "naked" version of from Centenario Coupe officially rolled recently in Monterey Car Week, in Monterey, California. As quoted from Paultan, the new model is not included as part of the celebration of the 100th anniversary of Ferruccio Lamborghini. Lamborghini only produces as much as 20 units and now all of them was sold out. 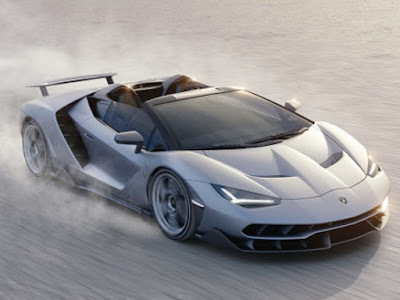 The open-roof supercar is offered with the special body color called 'Argento Centenario,' but the car owners can specify their own choice of colors with the Ad Personam personalisation programme. These special models are supported by monocoque chassis and carbon fiber body. Some of the features in the Centenario Roadster are the same as in the coupe version including rear wheel drive system, independent shifting rod (ISR) transmission system, magneto rheological suspension, rear wing that extend up to 150 millimeters, 21-inches five-spoke rims at the rear and 20-inches for the front, as well as wrapped by the Pirelli PZero tires. Its interior equipped with 11-inches touch head unit screen with Apple CarPlay. As an option Lamborghini offers a rear camera and telematics features. The source of power comes from the 6.5 liter V12 engine that can produce 759 horse power. These slim car can accelerate from 0-100 kph just in 2.9 seconds and has a top speed of 350 km per hour. That's cool wasn't?